On this day in 2012, Kendrick Lamar released his classic major label debut, good kid m.A.A.d city. And to celebrate the fifth year anniversary, we’re looking back at a few of our favorite memories from around the album’s release. A few days before GKMC dropped, Kendrick had a show in Las Vegas. After, our feature writer Andreas Hale and I linked up with the TDE crew at a random studio to talk about the album and, without prior knowledge, witness Kendrick, Ab-Soul and Jay Rock record “The Heart pt.3.” Talk about an epic night. In between recording, we sat down with Kendrick Lamar to have him break down one of the album’s standout tracks, “Sing About Me, I’m Dying of Thirst,” for Jay-Z’s Life+Times. 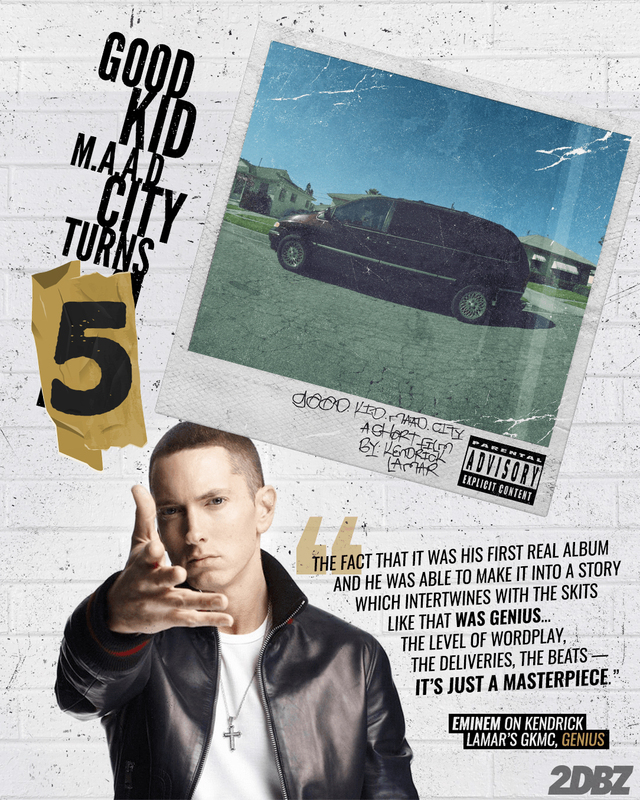 Last year, for the four year anniversary, Eminem went as far as calling the album a “masterpiece.” Do you agree?